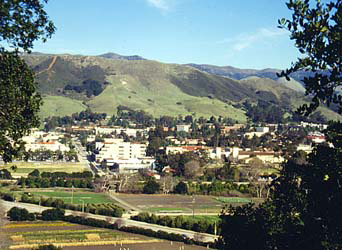 Cal Poly's motto is Learn by Doing, which has guided its instruction for over 100 years. This motto has been a guiding principle since the inception of the Agribusiness Department, which has its roots in two departments, Farm Management and Agricultural Business Management. In 1970, the two departments were merged into the Department of Agricultural Management, which offered two degrees: farm management and agricultural business management. In 1975 the two degrees were also merged into one degree: Agricultural Business. Today, the Agribusiness Department has an enrollment of over 650 students and a minor in agribusiness that is mainly taken by agricultural science majors. Students in Agribusiness graduate with a core understanding of business principles, economics, and science as they apply to agriculture. The faculty members in Agribusiness believe in balancing theory with practical application. They are strongly committed to Cal Poly's Learn by Doing philosophy. This faculty believes it is important to establish a close relationship between faculty and students in order for students to view faculty as professional role models and learn from their example outside, as well as inside, the classroom. In addition to knowledge and skills, the faculty hopes to imbue each student with an attitude of professionalism and a love for life-long learning. The Agribusiness Department has over 5,000 active alumni. This alumni base along with the Faculty's network with industry results in frequent opportunities for Agribusiness students to obtain summer jobs and internships. These opportunities provide a context for participating in the application of classroom knowledge and stimulate further interest in classroom learning. Many students use these summer work experiences to obtain jobs after they graduate. The Agribusiness program has always been characterized by student involvement in and out of the classroom. The ABM/NAMA Club has a membership in excess of 100 and sponsors various activities such as the Agribusiness Showcase. Approximately 80 agribusiness firms participate in the showcase to make contact with students for internships and/or for permanent career positions. The club also runs several food booths for fund raising during the annual Open House event. The Agribusiness Department has a rich history in national collegiate competitions. It has sent a team to the National Agri-Marketing Association (NAMA) competition since its inception in the late 1970's where it has earned first place eight times. This feat is more than any other university in the nation. In the FDRS Student Case Study Competition, Cal Poly teams have won first place four out of the five times the competition has been conducted. At the College and University level, Agribusiness Students have historically played an active role in student government. Since 1998, nine Agribusiness students have served in top ASI positions: President, Executive V.P., and Chairman of the Board of Directors. Students are also active at the College level, providing leadership to the Ag Council, a coalition of College of Agriculture, Food & Environmental Science clubs.